# Put the sliced onion into the kneading bowl, add the crumb. Knead the crumbs and onion well. # Add the ground meat, tomato paste, crushed red pepper, black pepper and salt onto the mixture. Knead all the ingredients for 8 minutes. # Refrigerate this mixture for 1 hour. # Divide the mixture into 6 pieces, cover each piece around the skewer, and fix the stuffing around skewers by the help of your wet hands. # After fixing all the stuffing around the skewers barbecue them. 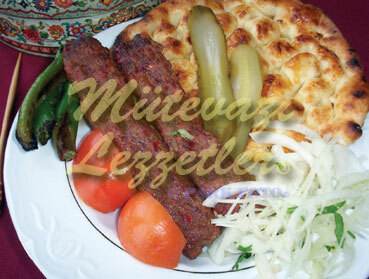 # Serve a kebab with a pide as a portion. Garnish with finely sliced onion, roasted long green pepper and tomatoes, and finely sliced gherkins. Note: It is advised to use flat skewers for fixing the stuffing. Otherwise the stuffing lies over from the skewers.